Netflix, Foxtel Now, live sport and catchup TV. Only Telstra TV lets you stream it all and search across your favorite apps with one Wi-Fi remote. Plug and play. Stream all day. Just plug your Telstra TV box into your TV set, connect it to your Wi-Fi and you’re ready to play. And with our new voice enabled Wi-Fi remote, you can search across apps for shows you love. Up to 20 new release rentals, on us. Telstra Smart Modem™ Gen 2 With 4G mobile network backup to help you stay connected. Included in the monthly price for new Telstra customers who stay connected for 24 months. Learn more. Phone line + unlimited calls To Australian mobiles, standard local and national numbers. See call rates. Discounted international calls See countries and rates. Broadband Protect Online security to help keep your family safe. Please be patient while our system processes your address. Already have home Internet with Telstra? Just buy Telstra TV outright. Simply plug and play. Telstra TV is a set-top box that plugs into your television and allows you to stream movies and TV shows from your subscriptions and services like Netflix, Kayo, Foxtel Now, and Telstra TV Box Office; as well as free-to-air TV. All of this in one device, controlled by one remote. What do the apps cost and do any come with Telstra TV? The apps are available through Telstra TV, however they do not come free with Telstra TV. You can purchase streaming services with Telstra, and they will appear on your Telstra bill. However these do not come with your Telstra TV purchase. What are the features of Telstra TV? We’ve made all your entertainment needs available through Telstra TV. You can access and search for the content you love across live TV, five Australian free-to-air catch up apps, Foxtel Now, Netflix, Stan, DocPlay, Garage Entertainment, AnimeLab, Hayu and Telstra TV Box Office. The more you use Telstra TV, the better it gets to know you. Over time, your home screen will become personalised and curated with shows that you’ll love. You can control your Telstra TV remote using your voice, and because its Wi-Fi enabled, you won’t even need direct line of sight to your Telstra TV. You can also turn your TV on and adjust volume with your Telstra TV remote. Use your smartphone as a remote with the Telstra TV app. Search easily using your phone keypad. Plus you can listen via your smart phone while you watch on your tv. How do I set up the Telstra TV box? Telstra TV is super easy to set up – simply follow the steps below. For troubleshooting issues go to https://www.telstra.com.au/support/category/entertainment. Why should I buy Foxtel from Telstra? When you buy Foxtel with us, you’re able to get all of your Telstra services on the one Telstra bill. Plus you can enjoy discounts that may not be offered by Foxtel. What is the difference between Foxtel and Foxtel Now? Foxtel Now streams TV series, movies, sport and news on demand to your mobile device. Foxtel broadcasts live sport, shows and movies to your home TV via a set-top box. How can I purchase Foxtel Now and how much is it? You can purchase Foxtel Now after you have purchased an internet package or on our Foxtel Now page. Foxtel’s latest prices are also on this page. I don’t want Foxtel. Can I just get the internet? Yes, you can buy a standalone internet plan that includes data and unlimited calls to standard Australia numbers. How do I cancel, or change my Foxtel service? You can also modify your Foxtel service in My Account. New Telstra TV. It's a lot to love. Better quality viewing that demands less from your connection. Stop and rewind free-to-air live TV for up to 30 minutes. Works with your Google Assistant on smart devices like Google Home. Get the Telstra TV app to watch your faves on your phone. New to streaming? Get Telstra TV and enjoy three months of unlimited access to these great apps. New users get three months unlimited access to Garage premium when they activate a subscription on Telstra TV. Eligible customers visit https://hub.telstra.com.au/offers on your PC/Mac or subscribe through the Garage app on Telstra TV. Garage boasts the world's most comprehensive adventure sports film and TV library, from the most well known and loved brands in action sports. For new 18+ Telstra TV customers only. After 3 months, you’ll roll over to a $4.99/mth subscription unless you cancel. Data charges apply. For full Terms & Conditions go to: https://www.garagemovies.com/terms-conditions. Activate your Telstra TV and get 3 months unlimited access to Hayu. Available to new subscribers only. Eligible customers visit https://hub.telstra.com.au/offers on your PC/Mac to sign up, or open the Hayu app on Telstra TV and follow the prompts. Hayu is the home of reality TV, with over 200 shows (many available the same day as the U.S.) and 6,000+ episodes to download and watch on the go. For new 18+ Telstra TV customers only. After 3 months, you’ll roll over to $6.99/mth subscription unless you cancel. Data charges apply. For full Terms & Conditions go to: www.hayu.com/utilities/terms. New users get three months unlimited access to the DocPlay catalogue when they activate a subscription on Telstra TV. Eligible customers visit https://hub.telstra.com.au/offers on your PC/Mac or subscribe through the DocPlay app on Telstra TV. Be inspired and intrigued by the world's best documentaries. DocPlay curates hundreds of thought-provoking titles on true crime, fashion, nature, and technology. For new 18+ Telstra TV customers only. After 3 months, you’ll roll over to $6.95 subscription unless you cancel. Data charges apply. For full Terms & Conditions go to: https://www.docplay.com/terms-conditions. New users get three months unlimited access to AnimeLab premium when they activate a subscription on Telstra TV. Eligible customers visit https://www.animelab.com/telstra or subscribe through the AnimeLab app on Telstra TV. Discover over 8,000 episodes from the biggest Anime franchises with AnimeLab, Australia’s No.1 Anime channel for classic hits and new series direct from Japan. For new 18+ Telstra TV customers only. After 3 months, you’ll roll over to $6.95/mth subscription unless you cancel. Data charges apply. For full Terms & Conditions go to: www.animelab.com/terms-conditions. The biggest apps in entertainment are all yours with Telstra TV. Connect them to your Telstra bill and make life even easier. With Netflix, you can instantly stream your favourite TV shows and movies right to your TV. Watch what you want, when you want. No commercials. No hidden fees. No hassles. And you can cancel anytime. Telstra TV Box Office Offer: For new and existing Telstra TV Box Office/ BigPond Movies customers. Must activate Telstra TV and complete Telstra TV Box Office registration before 26.08.19 and for use within 24 months of registration. For use in Australia. Bonus data will be removed if you move to a different plan. Offer ends 30 June 2019 unless extended. 4K: To access 4K features you will need an iQ4, compatible HDMI cable, compatible 4K TV and subscription to the HD and Sport Packages (included in Platinum HD). Any other connected equipment must also be compatible with Foxtel’s 4K UHD Standard. For more info see Foxtel.com.au/compatibility. What does ‘buy’ mean on Telstra TV Box Office? Buying a movie or TV show on Telstra TV Box Office allows you to stream that title as often as you like using your BigPond Movies account for as long as we have the right to make the title available to you. Only available for use in Australia. Compatible device required. The ROKU POWERED logo is a trade mark or registered trade mark of Roku, Inc in Australia, the United States, and other countries. Netflix ISP Speed Index is a measure of prime time Netflix performance on a particular ISP and not a measure of overall performance for other services/data that may travel across the specific ISP network. Google Home: Requires Wi-Fi, a Google Account and a compatible device. Google and Google Home are trademarks of Google LLC. Available now on Netflix: TIDELANDS and BIRD BOX Netflix streaming membership required. Available now on Stan: BLOOM and ESCAPE AT DANNEMORA. Available now on Foxtel Now: GOGGLEBOX S9 (MA15+) and GAME OF THRONES (MA15+) S1-7 Available On Demand, S8 April 15 HBO 2019 © Home Box Office, Inc. All rights reserved. HBO and all related service marks are the property of Home Box Office, Inc. Available to rent or buy on Telstra TV Box Office: A STAR IS BORN© 2018 Warner Bros. Entertainment Inc. and Metro-Goldwyn-Mayer Pictures Inc. All Rights Reserved. BOHEMIAN RHAPSODY© 2018 Twentieth Century Fox Film Corporation, Monarchy Enterprises S.a.r.l. and TSG Entertainment Finance LLC. All rights reserved. Available 27 Feb on Telstra TV Box Office: ROBIN HOOD© 2018 Summit Entertainment, LLC. All Rights Reserved. With backup from our 4G mobile network, the Telstra Smart Modem™ Gen 2 gives you a connection you can count on. Using its inbuilt SIM, your modem connects to our mobile network until your home internet connection is installed. This means you can browse using your home broadband allowance – and make and receive calls if you’re on the nbn™ network – when you first receive your modem. If there’s a problem with your home internet, your modem will help keep you online by connecting to our mobile network. If you’re on the nbn™ network, your home phone will also work over the 4G back-up connection. Once the issue is resolved, your modem will switch back to your home internet connection. Standard Evening Speed on the nbn™ network 20 Mbps typical minimum speeds between 7pm and 11pm. nbn™ speeds experienced may be lower due to various factors including your in-home set up and wiring. 4G coverage required. Telstra Modem backup limited to 6/1Mpbs. FTTB technology runs an optic fibre line from the nearest available fibre node to your building’s communications room. From here, a copper line runs to your wall socket. FTTN technology runs an optic fibre line from the nearest available fibre node in your street, or a nearby street with a final stretch of copper to your wall socket inside your premises. FW technology starts at a Wireless tower. The tower sends the signal to a fixed antenna on your roof, which continues through internal wiring to your wall socket. HFC technology runs an optical fibre line from the nearest available fibre node to your street. From here, a coaxial cable runs to your wall socket. Which speed is right for you? Perfect for everyday use in a small household. Browse the web, email, stream videos, and check in with your social networks. Great for homes with multiple people sharing the internet at the same time. Stream HD movies and TV. Download and upload large files. Fast even when numerous people are online at once. Stream 4K movies and TV, and experience super responsive online gaming. Telstra speed testing conducted in Jun - Nov 2018 indicates that around 90% of our nbn customers (excluding Fixed Wireless customers and those FTTB/N/C customers with a limited maximum line speed) on Standard Plus Evening Speed experienced these speeds between 7pm-11pm. nbn wireless technologies (Fixed Wireless) comes with Standard Evening Speed and typical speeds will be lower. FTTP technology runs an optic fibre line from the nearest available fibre node directly to your premises. What speeds can I expect on nbn™, ADSL, and cable? It depends on your location. We’ll need to do a speed test. All speeds are indicative only. Speeds experienced may be lower due to various factors including your location, in-home internet setup and wiring. Can I get a speed boost with my plan? You can buy a Speed Boost, if it’s compatible with your service. If it is available to you, you can purchase it in our online shop after you have selected an internet plan. Otherwise, we can test your service after activation and let you know if it’s compatible for a Speed Boost. Your service cannot exceed the maximum possible speed available at your premises, regardless of the Speed Boost on your service. How much does a Speed Boost cost? What speeds can I expect with a Speed Boost? We will text your line speeds 21 days after connection for the maximum speed available. Speed Boosts are not available for nbn Fixed Wireless connections. Speeds experienced may be lower due to various factors including your in-home setup and wiring. You cannot exceed the maximum possible speed available on your service and at your premises. Find out more about speeds on the nbn network at telstra.com/nbn-speeds. How do I improve my Wi-Fi coverage? You can buy a Telstra Smart Wi-FiTM Booster for $120 outright, or pay $5/mth for 24 months (min cost $120 over 24 months). You have to be on an eligible Telstra internet plan to take up this offer. Telstra broadband service and Telstra Wi-Fi Modem required. Maximum of four Telstra Smart Wi-Fi Boosters per account (2 x twin packs). What if I go over my monthly data allowance? Your speed will be slowed to 256kbs. You can top up your monthly home internet data allowance three times a year, for free. Top up must be equal to your base monthly allowance, and expires at the end of your current billing cycle. Why do I need an installation appointment? We need access to your property to install the equipment. What if I have a medical or security alarm? Ask your alarm provider if it’s compatible with the nbn™ network. If not, ask about alternatives. Do this before you switch to the nbn™ network, or your alarm may not work. Make sure you register with the nbn co's Medical Alarm Register. What happens to my existing phone lines? Once you switch to the nbn™, your phone will run via the internet. This means you can only have one phone line and it must be connected to your modem. What if I have a fax machine? The nbn™ doesn’t support fax. Can I change my current Telstra internet plan to one of your new plans? Yes, just purchase your new plan and our system will switch you over to the nbn automatically. You can do this at any time. Do existing customers receive a new modem? When migrating to the nbn™ we will check if your modem is compatible. If it is, we’ll provide you with the hardware you’ll need to connect to the nbn™ network. If your modem is not compatible, we’ll provide you with a new one. Want to upgrade your modem? You can buy a new one outright, or via our repayment option over 24 months. How much does the Telstra Smart Modem™ Gen 2 cost? The Telstra Smart Modem™ costs $216 outright, or $9 per month over 24 months. The modem is included in the monthly price of our casual Internet Plans for new Telstra customers who stay connected for 24 months. Simply pay off the modem if you decide to leave before the 24 months is up. What if I already have a Telstra modem; is it compatible with the nbn™? When migrating to the nbn™ we’ll assess your modem when you place the order. If it’s compatible, we’ll send you a free conversion kit with easy-to-follow instructions. If it’s not compatible, we will send you a Telstra Smart Modem™ so that you can connect to the nbn™ network. Does the Telstra Smart Modem™ Gen 2 work on cable, ADSL and nbn™? It works on all three technology types. If your area switches from ADSL or cable to nbn, we’ll send you a conversion kit so you can use your modem on the nbn. What is the 4G SIM and how does it work? It’s a backup device built into the Telstra Smart Modem™. 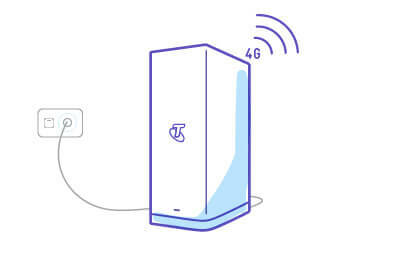 If your nbn™ connection drops out, the modem will switch to Telstra’s 4G mobile network if you’re in a 4G area, to help you stay connected with less interruptions. What internet speeds will I get on the 4G backup SIM? Speeds are capped at 6 Mbps download and 1Mbps upload. Actual speeds will vary due to local conditions and content accessed. What if I just want a home phone line? You can buy a phone-line-only plan from Telstra. Does my internet plan include a landline handset? No. You can buy one from Telstra. Can I add a mobile phone service to my internet plan? No, you’ll have to buy the mobile service separately. You can choose to have your mobile phone and internet plan on the same bill.